In 1979, two Birmingham businessmen, the Ozanne brothers, decided to launch a new education journal, the International Journal of Educational Development, to fill a perceived niche in the market. They were concerned about the cynicism that they encountered in developing countries with regard to the so-called ‘experts’ who arrived for brief visits and then felt able to write definitive reports. They were also concerned that the importance of education in the development discourse was being squeezed out by economists. They therefore aimed to publish a journal containing articles based on research into policy and practice in the developing world which might influence policy-makers. The first two volumes of the journal were published by W.I. Ozanne and Associates Ltd., and were printed by a firm in Hong Kong, but it became apparent that this system was economically not viable. Bill Ozanne, therefore, approached Pergamon Press in Oxford to see if they would like to add the journal to their social science portfolio. They agreed enthusiastically, beginning with Volume 3, Number 1 in 1983. Elsevier Science Ltd. later took over the Pergamon imprimatur and continued to publish the journal, which is now recognised as one of the leaders in the field. To celebrate the first 10 years of the International Journal of Educational Development, it was agreed to host a conference in Oxford. Thus the first International Oxford Conference on Education and Development was held in September 1989 and attracted over 80 participants from 26 different countries. Meanwhile, several academics and individuals concerned about the apparent decline in the number of British personnel involved in international education met to see how to increase collaboration between the different constituent groups. The key figures were Beverley Young (British Council), Peter Williams (Commonwealth Secretariat), Kenneth King (University of Edinburgh), and Keith Watson (University of Reading). These discussions led to the creation of the United Kingdom Forum for International Education and Training (UKFIET), which eventually brought together professional associations such as the British Comparative and International Education Society (BCIES), the British Association of Teachers and Researchers in Overseas Education (BATROE); non-governmental organisations such as Action Aid and Oxfam; and agencies such as the British Council, and the Commonwealth Secretariat, to share ideas and organise a biennial international conference on education and development. It was agreed that, in addition to organising Oxford conferences, UKFIET would hold colloquia/seminars on key educational issues. 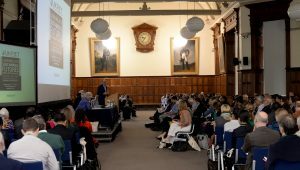 The underlying idea was that while organisations such as BCIES and BATROE would continue to hold their own annual conferences in one year, they would benefit from coming together every second year as part of a larger event. This would include delegates from international bodies such as the World Bank, UNESCO, DFID and the EU together with academics and researchers from around the world. The first UKFIET-sponsored Oxford International Conference on Education and Development (though in reality it was the second such event), was held in 1991. UKFIET Conferences have been held in alternate years since then. The success of UKFIET and the first few Oxford conferences facilitated closer co-operation between different groups involved in comparative and international education in the UK. It also coincided with major changes in funding for educational research, moves towards greater collaboration between institutions and organisations, and the decline in funding for overseas students. With the obvious benefits of such alliances, negotiations took place during the mid-1990s between the officials of BATROE and BCIES to combine as a new and larger association of interested professionals. Rosemary Preston (University of Warwick), the then Chair of BCIES, together with Thelma Henderson (also of the University of Warwick), the then Chair of BATROE, Bill Ozanne, the Secretary of both UKFIET and BATROE, Peter Williams (formerly Commonwealth Secretariat), and Keith Watson, the then Chair of UKFIET, undertook to draw up a new constitution for the reformulated society. The merger was agreed at the UKFIET Conference in September 1997, and the new name confirmed as the “British Association for International and Comparative Education” (BAICE). This was ratified at the inaugural BAICE conference at the University of Reading in September 1998. The origins of BAICE are reported fully by Rosemary Preston, and the story of its precursors is told by Lalage Bown, in the Forum section of the journal Compare (2018, Vol.48, No.5, pp 801-820). This Forum, with contributions from 11 individual authors, was produced to celebrate the 20th anniversary of BAICE, to reflect on the past and to foresee challenges ahead. Since 1998, BAICE and UKFIET have worked in tandem with each other. The Members of BAICE are all individuals, mostly academics and researchers. The Members of UKFIET are all organisations, including university departments, development agencies, consultancy firms, and non-governmental organisations. These member organisations nominate people for appointment to the Executive Committee of UKFIET, which arranges consultation meetings and other events between the biennial conferences. A separate Conference Committee is constituted in advance of each major Conference, consisting mostly of convenors for each section and sub-theme of the programme. UKFIET has been a registered charity since 2006, with Operational Guidelines which were last revised in 2011. Every other year for the past 30 years, the UKFIET Conference in Oxford has brought together hundreds of practitioners, researchers, consultants and policy-makers to debate the evidence, consider the impact and influence the policies of actors and agencies involved in education and development.